Napoleon’s Triumph, Bowen Simmons’ follow-up to his unique Bonaparte at Marengo, is now available for pre-order. As previously discussed on ZOI, Simmons’ designs are distinguished by their graphical fidelity to “the look,” the distinctive visual aesthetic characteristic of battle maps and military cartography. The Austerlitz game (pictured above), which is about twice the size with twice as many pieces as its predecessor, promises to remain faithful to the core elements of the previous design, while also introducing hidden units, leaders (note the battle flags above), and corps-level formations. Bonaparte at Marengo has come into criticism in some quarters for typically bearing scant resemblance to the actual battle, either at the tactical or the operational level. 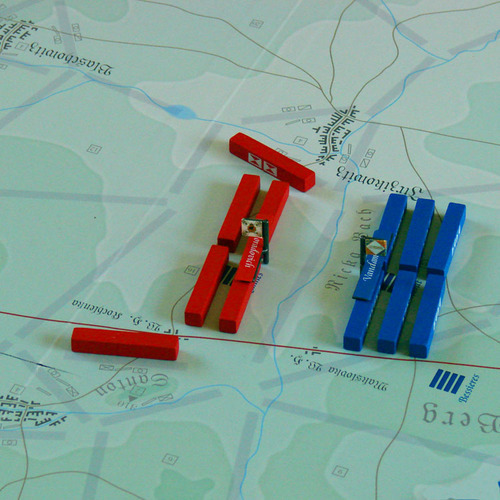 In the case of Austerlitz, the game will need to convey some sense of the shambles that was the Austrian/Russian command hierarchy, without straitjacketing the Allied player (the tension between the desire to preserve some evidence of historical fidelity without making the game run on rails is ubiquitous in wargame design). The game will also need to account for the literal fog of war that covered the battlefield at the beginning of the day and screened the initial troop movements on both sides, dispositions that sealed the fate of the respective armies. Napoleon’s Triumph is due to ship on August 15; I am looking forward to playing it.